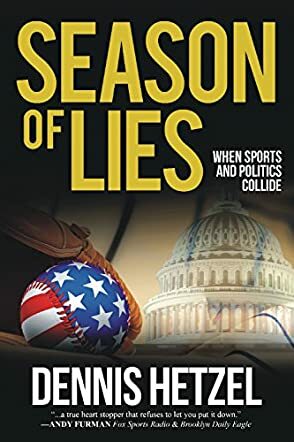 Season of Lies by Dennis Hetzel is a political thriller that creates an unbelievable link between baseball and politics, a book with well-developed characters and a gripping plot. It is 1908 and the Chicago Cubs have just scored an incredible victory, winning the World Series. Now they want the star pitcher, Trey Van Ohmann. At the same time, Luke Murphy, one of the biggest fans of the Cubs, is running for re-election as President of the United States and the stakes are high for him. The scene is set for a breathtaking political drama as the two men have to fight enormous odds, including terrorism, threats on their lives, and scandals to outmaneuver the toughest and most sinister adversaries and succeed, but can they? Dennis Hetzel’s novel is a page-turner and baseball fans as well as lovers of well-crafted political thrillers will find themselves eagerly turning the pages of this book. The characters are without compare, well-imagined and executed with stunning mastery; each character is developed with a solid background and personality traits that will keep readers intrigued and utterly interested in them. Conflict-driven, the plot moves at an incredible speed and each chapter is created to be an irresistible invitation for the reader to turn to the next. The compelling writing, coupled with well-timed paragraph breaks, makes for an interesting read. Season of Lies is intelligently written and the author comes across as a master of the genre. The setting and the themes are seamlessly woven into the story. This one was a rollercoaster ride for me, the kind of book you read and pick up again to savor some of the exciting passages.